Fast, efficient, and high-quality glass repair work for your Miami home. At The Glassperts, we not only pride ourselves on the best glass repair work in Miami-Dade and Broward counties, we also offer 24/7 emergency services. Whatever your glass work needs are, we’ve got you covered. If your glass window is broken or your patio door simply isn’t working correctly, we are just a call away. Because our technicians keep their vans stocked with all the necessary tools and glass types, we’re able to perform most of the jobs on the spot. Call us for a free on-site estimate today. WHY CHOOSE THE GLASSPERTS FOR RESIDENTIAL GLASS REPAIR? 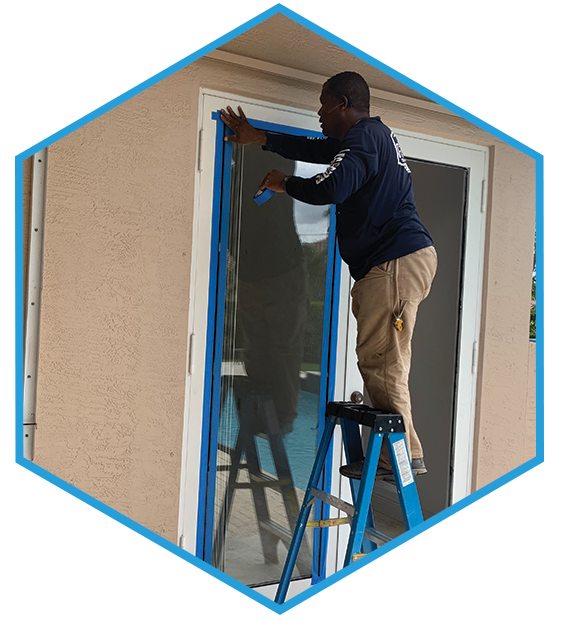 Our glass technicians are fully equipped to repair all the windows and doors in your Miami home. When it comes to residential glass repair or replacement work in Miami-Dade and Broward counties, you won’t find a quicker, more reliable company than The Glassperts. We are licensed and insured professionals who get the job done in a time and cost-effective manner. Our well-stocked vans come ready for just about anything, so you don’t have to be inconvenienced more than you already have been. We also know that broken glass never comes at a convenient time — sometimes it even comes at an incredibly inconvenient time. For that reason, we offer our residential customers emergency glass repair services 24/7. If you’re suffering from a glass emergency, don’t leave yourself unprotected. Please pick up the phone and call us any time of the day or night. We’ll make sure we get back to you quickly. One of the most convenient features we offer our customers is free estimates right there at your home, so you don’t have to feel worried about calling us out to you. One we arrive on site, our experts will take stock of the situation and explain to you exactly what the repair process will look like and give you the necessary costs to complete the job. If you’re happy with your estimate, they can usually complete the job right then and there! Our technicians keep their vans stocked with the tools and materials needed to complete most glass repair jobs. They’re fully-trained and have experience dealing with every type of unique situation you can think of. We operate this way to ensure you receive the best possible service in the shortest amount of time. You won’t find any other Miami glass repair company that operates quite as efficiently as we do. However, if you do require specialized glass work, that’s no problem either. Our team will board up your window or door so you have the protection you need while you wait for replacement glass. On top of that, our strategic relationships with suppliers allow us to receive custom glasswork in record time. You won’t find the same level of speed and service with any of our competition. Don’t Wait Another Minute If You Are In South Florida And Need Residential Glass Repairs. Contact The Experts Today!